Pomegranates: Cultivated from ancient times, pomegranates originated in Iran and are mentioned in the Bible, Quran, Homeric Hymns and Babylonian texts. In Turkey, the pomegranate’s red color is celebrated as a reminder of the human heart, which bestows life and fertility. The fruit’s medicinal properties are a sign of health and the round shape of the seeds, which resemble coins, suggests prosperity. Fish: The fish has a long history in ancient cultures around the world, and is a popular New Year’s food in China (although Chinese New Year is celebrated at a later date than the western New Year). What’s so lucky about fish? In Chinese the word for fish is similar to “abundance.” To ensure an entire year of good luck, the fish is served intact with head and tail. Whether or not you serve whole or as filets, there are other reasons for “fish fortune”—the scales resemble money and the swimming in schools represents plenty. Noodles/Lentils/Peas: Around 3,000 years ago China introduced buckwheat to the Korean peninsula and eventually to Japan. In 1270 Buddhist monks in Japan perfected powdered buckwheat that then was used to make dumplings and other dishes. By the 16-17th centuries in Japan, buckwheat was made into soba noodles and popularized as an affordable dish. In China, Japan and other Asian countries, long noodles represent longevity (be sure not to break them!). Lentils meanwhile originated thousands of years ago in India and Pakistan. Because lentils look like coins, they symbolize prosperity, particularly in Hungary and Italy, the latter even extending the metaphor to lentils “expanding” when boiled. Similarly, black-eyed peas bear a resemblance to coins and are consumed in the southern United States in a dish called Hoppin’ John on New Year’s Day. The next day, leftover “Hoppin’ John” becomes “Skippin’ Jenny,” indicating frugality and promoting prosperity in the coming year. Black-eyed peas are thought to have originated in West Africa and brought to the United States through trade. Green salad: Greens are eaten because they are similar to the look of paper money. Cornbread: In the Southern United States, the cornbread’s color suggests that of gold. Round fruit: Round fruits are chosen because their shape suggests coins and they offer the hope for a “sweetness” for the coming days. In the Philippines, 13 fruits are considered lucky, while in Europe and the United States, 12 pieces represent the months ahead. The tradition in Spain is to pop a grape for each strike of the bell at midnight on December 31. Round cake: Round-shaped cakes, often with coins or trinkets baked inside for luck, are indicative of unity, continuity and life coming full circle. For example, the Greeks eat vasilopita, a cake with a coin inside to bless their houses and to honor the 4th century bishop St. Basil, while the Dutch love their themoliebollen, or good luck doughnuts with currants. These were first eaten by the Germanic tribes in the Netherlands during Yule celebrations. To be authentic to the list of ingredients above, you can accompany the following entrée with soba or other noodles/lentils/peas and a green salad, garnish with lemon and finish the meal with grapes and other round fruits. 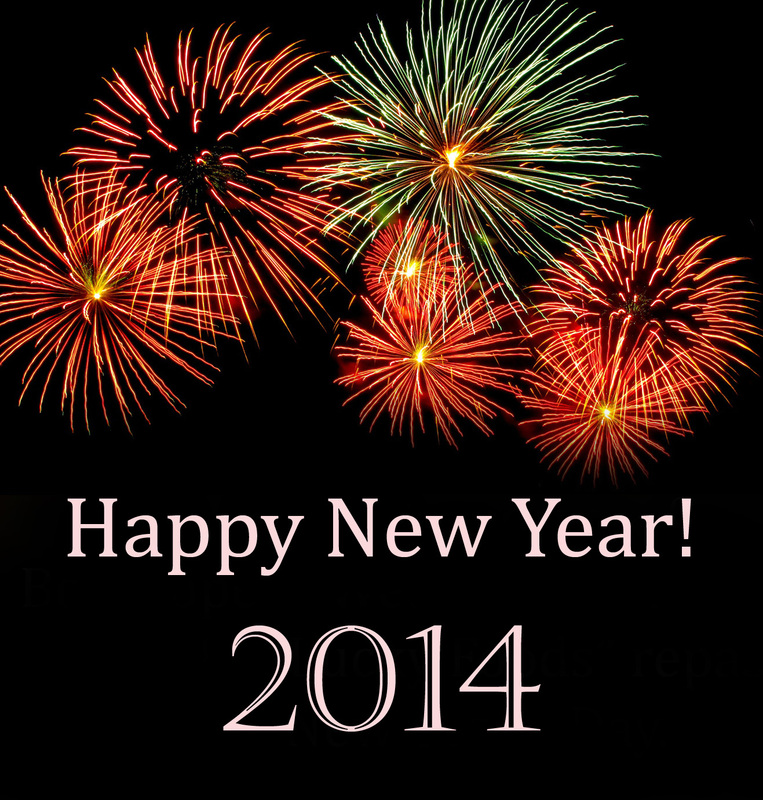 Then sit back and let 2014 roll in…you’re off to a lucky start. *Recipe courtesy of Wednesday Chef. Heat the olive oil over moderate heat in a large heavy-bottomed stock pot. Add the onion, carrots, pomegranate molasses and cumin. Cover the pot and lower the heat. Cook for 15 minutes, stirring occasionally. Add 3 cups of stock and simmer, covered, until the carrots are very tender, about an hour. Take off the heat and let cool. Purée, in batches if necessary, in a blender, adding the final cup of stock. The purée should be very smooth; if it isn’t, you may want to pour the soup through a strainer. Return to the burner and heat through until hot. Season with salt and pepper. 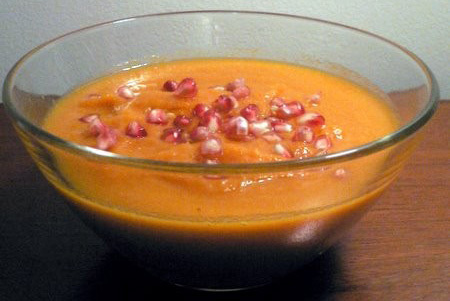 Ladle the soup into soup plates, spooning extra pomegranate molasses around the center (about one-half teaspoon per bowl) and sprinkling with pomegranate seeds. Serve immediately. *Recipes courtesy of Dinner and Conversation. In a glass dish, place salmon skin side down. Sprinkle with kosher salt, then pour French vinaigrette over the top. 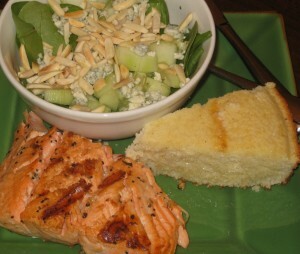 Marinate for 15 minutes – no more – marinades cook salmon! Heat a grill pan on medium high heat. Brush grill pan with olive oil, then place fish flesh side down, cooking until opaque 30 percent of the thickness. Flip to skin side. Cook in oven until opaque throughout. About 10 minutes total for 3/4 inch fillets. Add canola oil to a large cast iron skillet and place in the oven for 3 minutes. Combine cornmeal and baking soda, then mix with buttermilk and eggs. Pour hot oil into mixture, stir, then pour back into hot cast iron skillet. Bake for 22 minutes – or until edges are gently brown and an inserted toothpick comes out clean. *Recipe courtesy of Reader’s Digest. Preheat oven to 450°F; butter and flour four 4-ounce ramekins. In top half of double boiler set over simmering water, heat butter and chocolate until chocolate is almost melted. Beat eggs, yolks and sugar until light colored and thick. Mix chocolate and butter, and slowly pour into egg mixture, stirring constantly. Stir in flour until just combined. Pour batter into molds and bake for 6 to 7 minutes. Cake centers will be quite soft. Invert molds on plates. Let sit 15 seconds. Unmold. Serve immediately with whipped cream. This entry was posted in Blog, Bon Appetit Wednesday, Culinary, Culture, Holidays, Public Life and tagged ancient history, AntiquityNOW, Bon Appetit Wednesday, culinary, lucky food, New Year. Bookmark the permalink.